The Hunt is on for the Legendary Sand Shell on Morro Bay Strand. My wife and I love to hunt for sand dollars on the Morro Bay Beaches. The sandy circular treasures on the beach next to the rock always yields a few spectaular pieces. Actually, the dogs smell the shells and point. Kidding, I wish it were that easy. You really do have to keep a keen eye out for the dollar. 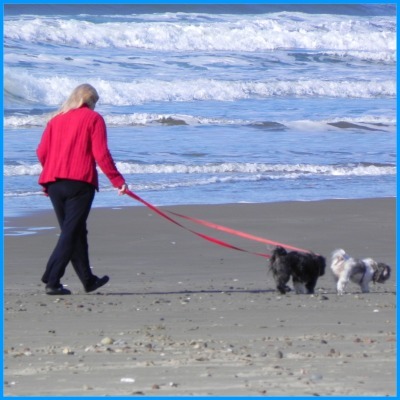 We love the Morro Bay Beach and the hunt for treasure is always an exciting adventure for us and the dogs. We let the dogs join in the hunt, they love it, and we love the challenge of searching for sandy treasures. If you have never been hunting for treasures on a beach now is the time to start. If you are on vacation or a day trip to the Central Coast of California make sure to save time to go treasure hunting. The day we took the pictures above it was stinging cold. January on the Central Coast of California can get mighty cool, so bring a jacket if you plan on spending any time on the beach. More information about the beach and sand dollars. More Pictures of hunting from our adventure. Hotwire - That's not all if you want one more option try Hotwire.com Central Coast Travel Adventures wants you to get the best deals possible on rooms, cars or flights etc.